A common dilemma with outdoor decking is which wood to use for its construction. Some are tempted to abandon the idea of wood altogether and get composite decks, which have wood fibers but also plastic ingredients. Or move straight to the PVC category and invest in plastic. Although these two choices have the benefit of not cracking or rotting over the years, they are much more expensive and look nothing like wood. Does that make our choice between wood for deck construction any easier? No. We still have a handful of options. The good news though is that not all wood is exactly the same. There are low- and high-cost wood deck types with different properties and thus different lifespan expectations. And their appearance is different too. Gazebos are independent structures. 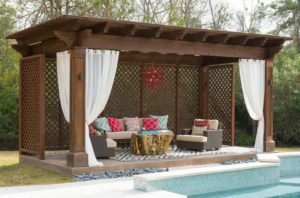 Unlike traditional wooden pergolas, which are attached to the house, gazebos stand on their own and become the queens of your landscape. Another main difference between these two constructions is that pergolas have open or semi-open (beamed) roofs while wooden gazebos come with closed roofs. The good thing with modern exterior designs is the freedom given to options. And so you don’t have to stick to the same old same old traditional gazebo designs.